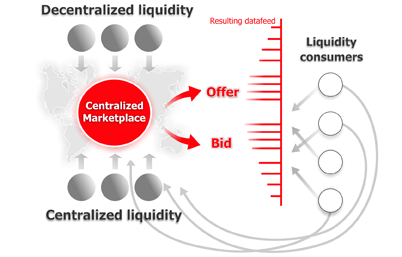 Among marketplaces with a centralized structure, Dukascopy Europe (EU subsidiary of Dukascopy Bank, Switzerland) gives access to the Swiss Forex Marketplace by combining liquidity of clients, other marketplaces and a number of banks. Clients' Trading Accounts with Dukascopy Europe can be funded via money transfer, bank guarantee or credit/debit cards funding. To cite a couple of clear examples of practical achievements from this technology, it can be mentioned that every client is able to trade 100 million GBP/USD and 200 million EUR/USD in One Click with effective spreads of 4-5 pips. When trading smaller amounts, one can obtain spreads as low as to 0.5-1 pips for majors. To gain access to SWFX (to open an account) please apply to Dukascopy Europe.